Leaving the European Union will mean that our laws will be made in Westminster, Edinburgh, Cardiff and Belfast. 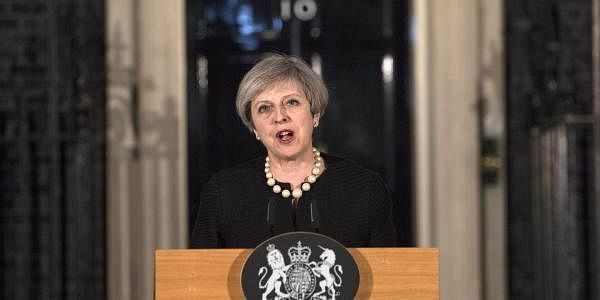 LONDON: Prime Minister Theresa May today reached out to the European press to strike a tone of friendship and send out a message that Britain's exit from the EU was not an attempt "to do harm" to the bloc. In columns published across a series of European publications, the British Prime Minister writes that a good exit deal for Britain from the European Union (EU) was in "all our interests". "We will continue to play our part in ensuring that Europe remains strong and prosperous and able to lead in the world," she writes in the 'Irish Times', a day after formally launching the process of the UK's exit from the EU. The common thread running through all the columns across Germany, Italy, France, Poland, Spain and Sweden was the message that Britain’s exit from the EU was not an attempt "to do harm to the European Union or any of the remaining member states". In Germany's 'Frankfurter Allgemeine Zeitung', she underlines close cooperation on foreign policy matters such as the conflicts in Syria and Ukraine. She also highlights international cooperation with Italy in 'La Repubblica'. In France's 'Le Parisien' newspaper, May flagged the importance of "the closest possible security cooperation" after Britain leaves the EU. The charm offensive came as the British Parliament prepares to unveil the draft of the Great Repeal Bill, which will set out the UK’s plan to remove EU law from its statute book. It will also incorporate thousands of pieces of EU law into UK legislation. "We will take control of our own laws and bring an end to the jurisdiction of the European Court of Justice in Britain. Leaving the European Union will mean that our laws will be made in Westminster, Edinburgh, Cardiff and Belfast. And those laws will be interpreted by judges not in Luxembourg, but in courts across this country," May had said in her statement to the House of Commons yesterday, notifying Parliament that she had invoked Article 50 of the Lisbon Treaty. Article 50 of the Lisbon Treaty gives both sides two years to reach agreement so, unless the UK and the 27 remaining EU member states agree to extend the deadline for talks, the UK will leave on 29 March 2019. "We already miss you. Thank you and goodbye," said Donald Tusk, the president of the European Council, soon after receiving May's letter formally notifying the other 27 EU members of Britain's intention to leave the economic bloc.